We started using H3 and H4 CCA Treated Pine in our substructures in 2013 purely in response to client’s requests to keep our prices down without affecting the quality of the timber or our workmanship. Up until then all substructures had been built using balau hardwood. After some thorough research we established that the correctly installed Hazard level (or H level) of CCA Treated Pine will in fact outlast balau. For full details of this process and to understand the process please visit the independent web site of The South African Wood Preservers Association (www.sawpa.co.za) There you will find full details of the process, the correct H level to use in which application and the correct methods of installing poles and other critical methods that we need to adhere to in order to activate your 50 year guarantee. As an update to this page, we have come across many decks in our refurbishment activities where the top of the balau joist or bearer has started to rot. There are such articles on this blog with images which can be found by using the search bar at the bottom right hand side of the blog. 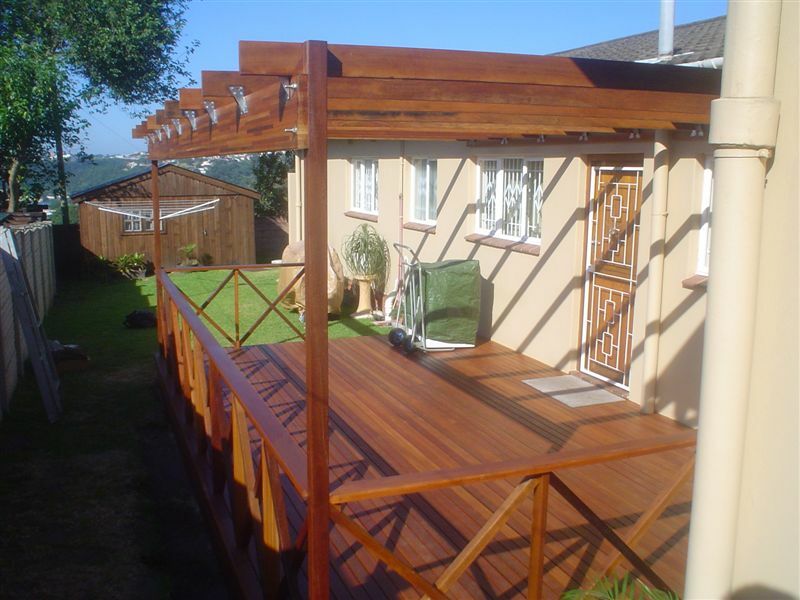 The supplier of the chemicals used in the timber preservation process offers between a 30 year and 50 year guarantee against, wood borer, termites and wood decay, brown rot, soft rot, white rot and other decay that renders the timber structurally unserviceable. At the time of writing this (8 Sep 2013) these guarantees are being underwritten by Santam. The guarantee is of course subject to certain conditions. When we install the deck we will document the entire build by taking photographs which are date stamped. There are certain methods we need to use, and document, whilst building. All of this will be documented and submitted to the supplier who will lodge it with Santam. Full details of this guarantee, the methods of construction and conditions are available on request. A small admin fee is payable in order to activate your guarantee and this fee is payable to us in order to document the build and submit the report to the guarantor. All of our decks are built using these guidelines regardless of whether or not we are activating a guarantee.